Do you know someone that has recently got engaged? 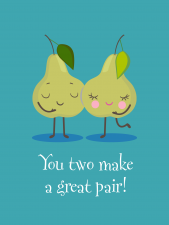 We have a great range of fun and quirky engagement cards to choose from! Our unique engagement cards are the perfect way to congratulate the happy couple and let them know you are thinking of them. You can add one or two slices of yummy Sponge Cake to your engagement cards - we recommend popping in two slices so the happy couple have a slice each! Our two card slices work out at great value too with one slice priced at £7.95 or you could get two slices for just £10. We have lots of flavours to choose from including Chocolate, Victoria, Millionaires and many more. We also offer gluten free cake card and vegan cake card flavours! When you order your Cake Card you can select any delivery date you would like. Order by 2pm for same working day dispatch (excluding bank holidays). Send you engagement card and cake in the post with a personalised message and we will have it delivered through the letterbox of the special couple.